The exhibition in the Museum of Ethnography shows us one more thing. Not only the ideological aspects of the movement, of that which is historical and that which is modern. It also acquaints us with the materials of Masonry — of that which it is, of its everyday activities. The creators of this exhibit have opened up to us the inside of a lodge, making use of the most authentic objects available. This partial representation of the inside of a Masonic Temple — we should be careful here not to be misled by the term — this is not a place for the ceremonies of some cult. The ritual that is performed here is very worldly. It has no connection with any concrete religion, even though in many Masonic systems we will find, here on the altar, a copy of the Bible, open at the beginning and closed at the end of labour. Yet, at the same time, we may see lying alongside the Bible, or in place of the Bible, a copy of the Torah, or the Koran, or the Vedas, or other holy volumes. There is one more important thing here. The lodge, or what we find in the lodge, is a representation of cosmic harmony. As examples of this cosmic harmony we find here symbols such as the moon, the sun, and the all-seeing eye. And if we were to look upwards in many lodges we would see a blue vaulted ceiling. Particular parts of the lodge are connected with the four corners of the world. Here we have the East, a raised platform, where are placed the most important members of the lodge, what we sometimes call the officers or the officials. 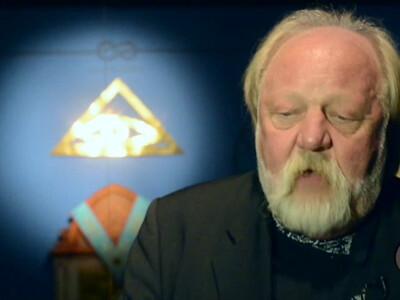 First of all, we have the leader of the lodge and in front of him the symbols of his authority. One of these, next to the sword, is the mallet. The mallet is, of course, a working tool, connected with the work of architecture. He holds this mallet, as do two other officers of the lodge, who sit on other sides. Here we have the East, and here, in a regularly laid-out Temple, on the opposite side, on the shortest side of a rectangle, we have the West. We always enter the lodge from the West. We have two wardens. They are what we call the lights of the lodge. Namely, the three most important officers of the lodge: the leader, the first warden and the second warden. It is the role of the second warden — one of many roles — to oversee the work of the apprentices. The journeymen sit in a row opposite the South, in other words, opposite the apprentices, and their labours are directed by the first warden. Here we have harmony; here we have authority. And this authority is very clearly emphasised in the absolute authority of the Master. This structure is not based on birth, on whether a person is rich or poor. No, this structure is based on equality on the same level of excellence.